The loud explosion brought me back to life seeming only to make my heart stop and send me right back to a lifeless world. I had just drifted into a light sleep the other night, snuggled comfortably inside the warm quilt when I was almost thrown off the edge of my bed by the sudden explosion. As a reflex, I pulled the quilt over the head trying my best not to let any noise disturb my half unconscious mind. But in doing so, I had unknowingly invited two unwanted guests in the nice confines of the quilt. The two mosquitoes which now hovered right around my ear seemed to be discussing about the best spot to land and have dinner. I’ve always wondered how mosquitoes never seem to miss buzzing right around the ears before getting down to some serious business. It must be sort of a hear-your-echo spot to hear their voices reflect back from the ear drum just like humans love to do around mountains. But as I was in no mood of hobnobbing with any tourists right around my ears, and also because the noise from the outer world seemed to increase by the second, I buried my head beneath the pillow. Only to realize soon that it was of no use. By now, I was almost back to consciousness as I poked my head out to look at the screen of my laptop besides me which showed it to be 1:35 at night. And the thumping in my head appeared to have a rhythm of its own. It was now matching the beats of the ‘Bollywood’ number which was now blaring at full volume through the windows. So, in a nutshell, all the commotion that disturbed my peaceful soul that cool night was from the wedding taking place at the park next block. Why they chose 1:35 in the night to begin the proceedings was beyond me. Maybe the bride eloped with her ex but changed her mind and returned for the proceedings. Or maybe the groom had to cope with sudden episodes of diarrhea. I couldn’t really guess. But whatever it was, it wasn’t the best time to topple unsuspecting innocent people in deep sleep from the edge of their beds. The events that carried on late into the night (or morning) had drastic effects on my body clock. I was still drowsy and irritated later in the evening when I remembered that I had to go and receive my uncle and aunt at the railway station. I thought the drive would help my mind a bit, so I drove off with some nice songs playing in my car. I hadn’t got very far when I was caught in between a rather messy traffic jam. Though the opposite side of the road was as empty as ever, the traffic on my side seemed to be stuck forever. There’s not much one can do when one’s car is stuck in traffic between two cars. So I just sat back and enjoyed the song in the car. But soon, the song seemed add more sounds and voices into it. I turned the knob in order to check whether another station was trying to hijack the one I was listening to. It was then that I realized that the newer, louder and a lot more distasteful sounds were those emerging from an oncoming ‘Baraat’. Those who know me well, can vouch for the fact that I’m rather patient with things. But that obviously doesn’t include a ‘Baraat’ full of drunk loonies, with a band making unbearable noises, which moves at a speed of a meter by the hour, with me having nowhere to run and bear the torture from a rather ‘ring-side’ view. * A wedding is the ultimate event, a chance of a lifetime for people to show off. * As a groom, it is probably the only chance ever for a good-for-nothing guy to feel like being the king of the world. * Looking at the lifelong neglect and partial treatment that most girls suffer in a male dominated Indian society, it’s their only chance to hog the limelight. * It is the best opportunity for the groom’s family to be at their obnoxious best and still be treated with utmost respect. * The bride’s family cannot find a better occasion to showcase their wealth, class and the so-called respect amongst their community. * It’s a handy chance for people to depict their beliefs/rituals/religiousness. No matter how much the cunning priests benefit from all the blind faith. * A wedding is the best excuse for people to be let off from work. * Weddings are the best opportunities for the ‘match-maker’ aunties to do brisk business and fix up forthcoming weddings. * Weddings are the best way to create public nuisance and still get away without any big hassles. Yes, there are people who enjoy creating nuisance and still feel immune to any action by being part of a wedding. No wonder India loves big fat weddings. Be it any part of the society, a wedding is the ultimate escape from the hassles of daily life. The big extravaganza provides a release for all the pent-up emotions/aspirations/dreams and all that sort. I have no problem with arranged marriages. On a nice sunny day and in a good mood, I may even approve of a person’s marriage being arranged. But I just cannot tolerate the nuisance of these Big Fat Indian Weddings !!! Exactly ! And don't even make me start to write about religious fanaticism in India. Yes. And though we do have laws against public nuisanse, no one ever cares to apply them in such instances. Getting together and having fun is always welcome. But when it disturbs those who are even remotely not related to the proceedings, that's when it gets overboard. seriously. u evr write a story on sum1s weddin, ppl wil flock to read it. i think v jus love drama n dere is so much of it at weddings plus d glamour quotient, dat it totally grows on u! n i dunno whr ur frm, bt once in ur life u absolutelyyy must chek out a south indian weddin! frm blaring music to d loudest possibl crackers.... in fact its only den dat u realise ur ear can actually tk so many decibels in one go! South Indian weddings are much different.. And very tiring for the couple.. At my place, if there is too much of noise, we just call the police and they will make it to a bearable level considering it is the time for board exams for students and the like.. And no procession on the road. 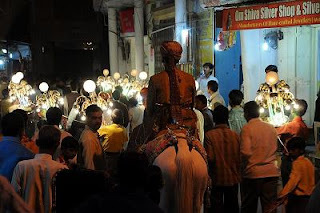 Baraat is from the car to the hall thats all.. For more details u can check my husband's post here for the groom's side experience and my post here for the bride's side experience .. Yes. I've heard about weddings in other parts of India. And they seem to be much saner than in these parts. I've even been to my friend's wedding in Kolkata, which was devoid of any such nonsense. Wish people could be a bit more sensible in our parts.